Xpressbet, LLC is an Advanced Deposit Wagering service that enables account holders to watch and wager on Thoroughbred, Harness and Quarter Horse races, at more than 300 US and international tracks, online, by phone or mobile device. Xpressbet is a legal, US-based, Advanced Deposit Wagering service, licensed and regulated in many states. Money wagered through Xpressbet is commingled with track wagering pools. All wagers are safe and secure. Some premium services, such as FedEx delivery, credit card deposits and Live Teller wagers, do carry additional charges. What are the advantages of Xpressbet? Easy Sign Up process gets you wagering in no time. No membership, monthly, or per-wager fees. Direct deposit of funds into your Xpressbet account with Xpressfund®, Green Dot @ the Register, PayNearMe, Neteller, cash, credit/debit card, check, wire transfer or money order (restrictions may apply). Funds can be withdrawn online, by phone, or in person. Winnings are automatically credited to your account immediately following each race. Safe and secure wagering with full track-odds payouts. Legal, licensed and based in the United States. Can I watch the races live online? Xpressbet offers fast, sharp streaming video of races from all of our tracks. Visit Xpressbet’s Available Tracks to see which tracks and states are currently available. Can Canadian residents have an Xpressbet account? Yes, Xpressbet is authorized by the Canadian Pari-Mutuel Agency to accept customers that reside in the province of Alberta. As required by the terms of our license with the Oregon Racing Commission, Xpressbet has ensured that account holder funds are properly held and maintained in a custody account at an FDIC-insured bank . These funds are not used for any purpose except to facilitate the wagering activities, and other instructions or agreements of account holders. Funds in the custody account shall remain the property of the account holders for all purposes, until wagered by the account holder or otherwise withdrawn or used in accordance with the account holder's instruction or agreement. Individuals must be at least 18 years of age (21 years of age in Alabama, Arizona, Indiana, Iowa, Kansas, New Hampshire, North Dakota, Washington). State racing commission regulations require Xpressbet to ask for your Social Security Number and to verify your state of residence. Please review our State Restrictions list to see if wagering is available in your state. Pennsylvania residents located within 35 miles of Harrah's Chester Downs, Philadelphia Park, Penn National, Pocono Downs or Presque Isle are prohibited from opening Xpressbet accounts. It only takes a few minutes to sign up. Funds must be deposited to your account before you can begin to wager and initial deposits must be a minimum of $10.00 in all states and jurisdictions, with the exception of Massachusetts, where the initial deposit must be $25.00. How do I sign up account? Call us at 866.88XPRESS (866.889.7737) daily between 10:30AM and 11:00PM ET. Once you deposit funds into your account you can begin wagering with Xpressbet. Click here for more information on deposits. We offer wagering online, by phone and mobile device. You can use the same account for all three. Online: Log In with your User Name and Password. Phone: Call 866.88XPRESS, or 866.889.7737 from 9:00AM to 9:00PM PT. Provide your Account Number and Password, or PIN number. Mobile Device: Account holders can now wager with most smartphone and tablet devices. Xpressbet offers most of the wagers available at the track — including exotic wagers such as trifecta, superfecta, pick 3, pick 4, pick 5 and pick 6. Money wagered through Xpressbet is commingled with existing racetrack pools. What type of wager information do you offer? Xpressbet provides all you need to play the races — program information, scratches and changes, live odds, expert analysis, and more. Additional, more extensive and detailed handicapping information, such as past performances, tip sheets, and analysis, is for sale in the Pro Shop, and can be ordered and downloaded directly from the Xpressbet site. Yes. Since money wagered through an Xpressbet account is commingled with existing racetrack pools, Xpressbet pays full track odds on all wagers accepted through the system. Why are some UK races not available for wagering? Some races in the United Kingdom attract incredibly large fields. Unfortunately, North American tote companies cannot process wagers on races in which there are more than 30 individual betting interests. Due to this limitation and our policy to commingle all wagers placed through us, Xpressbet is not able to accept bets on races where more than 30 horses are entered. All funding options may not be available for all customers. Your account is credited immediately following a winning wager. You can withdraw these funds at any time. You can request withdrawals online, by phone or in person. Visit Funding for more information. Xpressbet offers an extensive menu of Thoroughbred, Harness and Quarter Horse races and tracks. Visit Xpressbet’s Available Tracks to see which tracks and states are currently available. Visit State Restrictions to review a list of limitations by state. Xpressbet offers wagering at more than 300 US and international tracks — including Gulfstream Park, Santa Anita, New York Racing Association, Keeneland, Churchill Downs and many more. We would like to offer wagering and video for every track, but some are not available due to contractual restrictions. What are the hardware and software requirements for using Xpressbet? Please Note: You will not be able to log in to Xpressbet if you are running IE with Compatibility View enabled. To disable Compatibility Mode temporarily, use the icon in the upper right portion of your address bar. 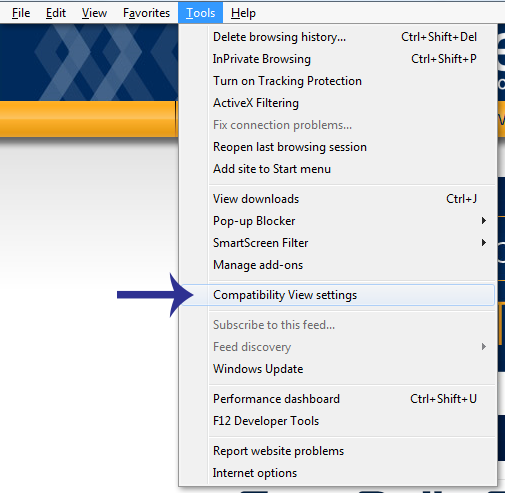 In order to disable Compatibility View for Xpressbet, simply click Tools in the Menu Bar, then Compatibility Mode Settings, and remove xpressbet.com from the list that pops up. If you do not see the menu with the Tools option, press Alt on your keyboard to make it appear. You do not need to purchase any additional software to use Xpressbet. Once you Sign Up, Log In to begin wagering. How do I enroll in XB Friends? To enroll in XB Friends, Log In and complete the XB Friends Enrollment Form. If you don’t have an Xpressbet account, Sign Up for Free. Is there a limit on how many Friends I can invite? No, there is no limit to how many Friends you can invite. What does my Friend need to do to ensure I receive my bonus? He or she must remember to use your unique XB Friends Number when they sign up for their free Xpressbet account. Your Friends will receive your XB Friends Number when you invite them using the XB Friends Invitation Form, but you can always give it to people yourself. Your Friend must deposit and wager at least $100 within the first 30 days of signing up for their free Xpressbet account. How do I obtain my XB Friends Number? When you enroll in XB Friends, you will receive an email confirmation that will include your unique XB Friends Number. Can I invite more than one Friend at a time? Yes. The XB Friends Invitation Form allows you to invite up to four Friends at a time. If you’re already enrolled in XB Friends, Log In to go directly to the Invitation Form. How will I know when my Friends sign up with Xpressbet? You will receive an email notification when one of your Friends signs up with Xpressbet. You will also receive an email when one of those Friends deposits and wagers more than $100 within the first 30 days of signing up. Once one of your Friends wagers $100 within 30 days of signing up, you will receive an email that notifies you that your bonus has been deposited into your account. All referral bonuses are deposited in the form of wagering credits. You have 30 days to use your wagering credit or it will be retracted. Wagering credits cannot be withdrawn. Who is eligible for XB Rewards? All Xpressbet account holders with an account in good standing are eligible to participate in the XB Rewards program. How do I sign up for XB Rewards? All Xpressbet account holders are automatically enrolled in XB Rewards. No additional registration is required to participate. What does it cost to sign up for XB Rewards? There is no cost to participate in XB Rewards. Can I opt out of the XB Rewards program? You cannot opt out of the XB Rewards program. Who should I call if I have questions about the XB Rewards program? If you have any questions about the XB Rewards program, our friendly Customer Service staff would be more than happy to assist you. Please contact Xpressbet Customer Service via email at rewards@xpressbet.com or by phone at 866.88XPRESS (866.889.7737) daily between 10:30AM – 11:00PM Eastern Time (times subject to change). You earn XB Rewards Points each time you place a wager with Xpressbet. Points are earned at a rate of 2 Points for every dollar you wager, with bonus multipliers applied once your handle volume or wagering frequency surpasses certain Rewards Level thresholds. The more you bet and the more days you wager, the closer you move to receiving bonus multipliers. You can also increase your Points total by taking advantage of one of our XB Rewards Promotions. When will the XB Rewards Points I earn be deposited into my account? The XB Rewards Points you earn based on your daily wagering totals – 2 Points for every dollar you wager – are deposited into your account each morning. The XB Rewards Bonus Points you earn based on your Rewards Level are deposited into your account on the first day of each month. The XB Rewards Points you earn for participating in an XB Rewards Promotion will be deposited into your account based on the terms of the promotion. How do I check my XB Rewards Points balance? How can I tell if I earned XB Rewards Points? You can keep track of the XB Rewards Points you receive by clicking on “XB Rewards” in the upper right-hand corner of the website and selecting “Rewards Statement.” Rewards listed in your Statement are broken down by the date you earned them, so you can quickly and easily track your Rewards balance. If you have any additional questions regarding your Rewards, please contact Xpressbet Customer Service via email at rewards@xpressbet.com or by phone at 866.88XPRESS (866.889.7737) daily between 10:30AM – 11:00PM Eastern Time (times subject to change). Do my XB Rewards Points expire? Your XB Rewards Points will expire if your account is inactive for 13 months. Your inactivity calendar resets each time you place a wager. Can I transfer my XB Rewards Points to another Xpressbet account holder? XB Rewards Points are non-transferrable and cannot be pooled between multiple Xpressbet accounts. Can I redeem my XB Rewards Points for cash? XB Rewards Points can be redeemed for Xpressbet wagering credits, which work just like cash and allow you to play the races instantly with your Rewards. Wagering credits cannot be withdrawn from your account. How can I use my XB Rewards Points? XB Rewards Points can be redeemed for Xpressbet wagering credits, past performances, tournament entries, racetrack discounts, electronics and VIP experiences. To view our entire Rewards Catalog, please visit Redemption Overview. Where do I redeem my XB Rewards Points? You can redeem your XB Rewards Points in the XB Rewards Shop section of the Pro Shop. To access the Rewards section of the Pro Shop, click on “XB Rewards Shop” on the left side of the Pro Shop. How often can I redeem my XB Rewards Points? There is no limit to how often you can redeem your XB Rewards Points. Can I automatically redeem XB Rewards Points? Only customers who are Diamond Level Players can choose to have their Points auto-redeemed for $100 Xpressbet wagering credits. To auto-redeem your XB Rewards Points on the first day of each month, click on “XB Rewards” in the upper right-hand corner of the website, select “Rewards Summary” and check the box next to “Auto-Redeem my XB Points” beneath “My Preferences.” Please note, the default setting is to not automatically redeem your Points. Is there an XB Rewards catalog? Yes. Please visit Redemption Overview to view our entire Rewards Catalog. I ordered the wrong item, how do I cancel it? If you need to cancel or change your order, please contact Xpressbet Customer Service via email at rewards@xpressbet.com or by phone at 866.88XPRESS (866.889.7737) daily between 10:30AM – 11:00PM Eastern Time (times subject to change). How long does it take me to receive the item? Virtual redemption items, including Xpressbet wagering credits and past performances, are available immediately following redemption. Please allow 2-4 weeks for delivery of physical goods, including tickets and electronics. If your item arrived damaged, please contact Xpressbet Customer Service via email at rewards@xpressbet.com or by phone at 866.88XPRESS (866.889.7737) daily between 10:30AM – 11:00PM Eastern Time (times subject to change). All items ordered from the XB Rewards catalog are non-refundable. Where will my item be sent? Your item will be sent to the mailing address you provided to Xpressbet when you registered for your account. To view or change your mailing address, click on “My Account” in the upper right-hand corner of the website and choose “My Info.“ Your Rewards item cannot be sent to another address. How are racetrack discounts delivered? If you redeem XB Rewards Points for track passes, gift certificates or other physical goods, an Xpressbet representative will contact you within 72 hours to arrange delivery. Are racetrack tickets and vouchers transferrable? Transfer rights for tickets/vouchers are at the discretion of the issuing racetrack. You should assume that tickets are non-transferrable unless otherwise noted. Where are the items being shipped from? Items will be shipped from Xpressbet’s Redemption Fulfillment Center in Washington, Pennsylvania. Is there a tracking number for the items I purchase? Xpressbet does not provide a tracking number for items shipped from the XB Rewards Catalog. If you have questions about the status of your order, please contact Xpressbet Customer Service via email at rewards@xpressbet.com or by phone at 866.88XPRESS (866.889.7737) daily between 10:30AM – 11:00PM Eastern Time (times subject to change). What carrier will deliver my items? Your items will be delivered via FedEx, unless otherwise noted. What if I miss the delivery of my products? If you are not available to receive package at delivery, FedEx will work with you to ensure you receive your item. If they attempt to deliver an item and you are not available, they will leave a door tag on your front door with information and instructions regarding the package delivery. What are Diamond Plus Bonus Points? Diamond Level players can earn even more Bonus Points when they wager at least $15,000 in a month. For more information on Diamond Plus Bonus Points, please visit the Diamond Level Overview. Is anyone restricted from the Diamond Level of XB Rewards? Residents of California, Virginia and Idaho are not eligible for Diamond Plus Bonus Points. Are Diamond Players eligible for XB Rewards Bonus Point Promotions? Yes, of course they are! XB Rewards Bonus Point Promotions are fulfilled independent of your Diamond Level Bonuses. For example, if you’re a Diamond Plus 1 player and you bet $10 on a promotion where you’ll receive 6X Points for your Pick 6 wagers at Gulfstream Park, you’ll receive a total of 180 Points for your wager - 80 for your Diamond Plus 1 Bonus and 100 for the 6X Points Promotion Bonus. Can I check my XB Rewards Points on Xpressbet Mobile? Currently, Xpressbet Mobile does not have the ability to provide your Rewards Statement. All wagers placed through Xpressbet Mobile will qualify for XB Rewards, though. Can I redeem my XB Rewards Points on Xpressbet Mobile? Currently, Xpressbet Mobile is not compatible with our Pro Shop. If you would like to redeem your Points, please do so via our Pro Shop or by contacting Xpressbet Customer Service via email at rewards@xpressbet.com or by phone at 866.88XPRESS (866.889.7737) daily between 10:30AM – 11:00PM Eastern Time (times subject to change). How do I qualify for XB Rewards Levels? Customers are automatically placed into an XB Rewards Level based on either their total wagering within a calendar year or the number of days they’ve wagered within a calendar year. To view the requirements associated with each Level, please visit our Level Qualifications. When does my new Rewards Level take effect? When your wagering amount or number of days wagered within a calendar year pass the qualification threshold required to move you into a Level, you will be placed into that new Level the following day. Rewards Level Bonus Points are calculated for the entire month based on your Level at the end of each month. For example, if you achieve Silver status on September 29, you will receive the Silver Level Bonus, 25% Bonus Points, on all of your September wagers. For how long do I remain in my new Rewards Level? You will remain in your new XB Rewards Level for the remainder of the current year, all of the next year, and then the following January. So if you achieve Silver Level in August of 2014, you will remain at least at that Level until February 1, 2016. In order to remain at Silver Level beyond February 1, 2016, your play in 2015 would also need to qualify for Silver Level. If you subsequently move to a higher Level, you will begin receiving that Level’s Bonus Points immediately.